The Highlands baseball team (12-11 overall) had a doubleheader scheduled at Cooper. Highlands was to face the host Jaguars and Madison Central. Excessive rain forced the cancellation of both. Highlands plays host to Bishop Brossart on Monday. Game time is 5 p.m.
PHOTO: Allen Ramsey, DWCPhoto.com. 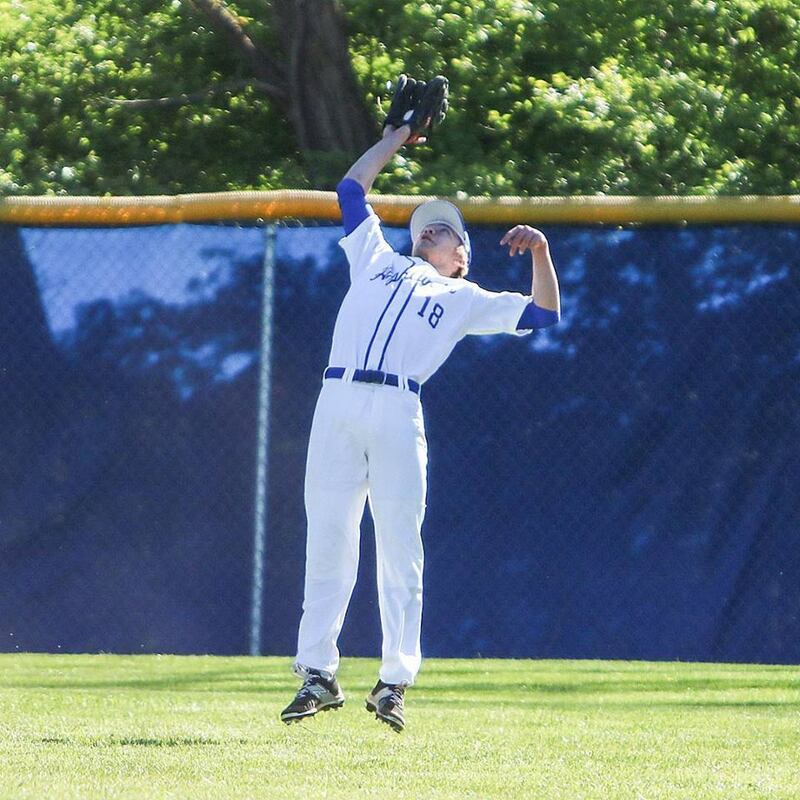 Highlands sophomore Drew Rom makes a great catch in a recent game. 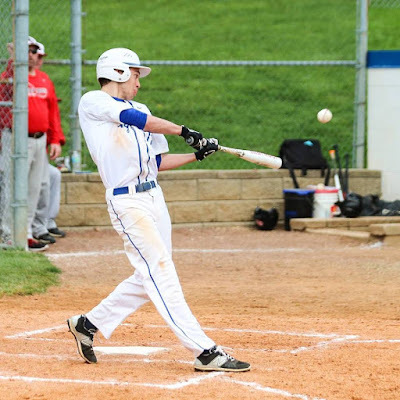 The Highlands Bluebirds baseball team (12-11 overall) fell to the Simon Kenton Pioneers for the second time this week, 7-4 in Independence on Friday. Highlands struck with one in the first inning. 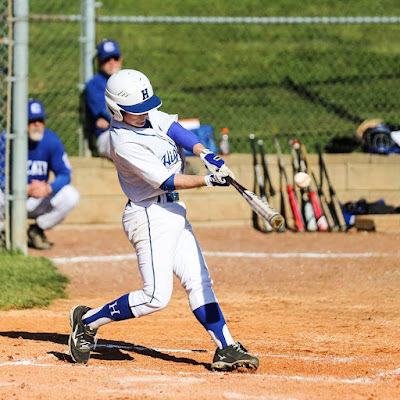 But Simon Kenton tied it up in the bottom of the frame then scored twice in each of the second, third and fourth innings to build a 7-1 advantage before holding off a Bluebird rally. PHOTO: Allen Ramsey, DWCPhoto.com. Highlands freshman third baseman Zoie Barth makes a play in Thursday's game against Dixie Heights. Highlands committed no errors defensively in the win. 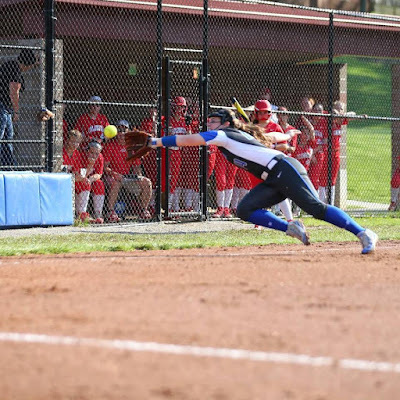 The Highlands Ladybirds softball team pulled away from the Dixie Heights Lady Colonels late Thursday in 9th Region action. Highlands (14-6 overall) moved to 8-0 in region play. The Ladybirds have won eight in a row. The Highlands Bluebirds baseball game against the Bellevue Tigers in 36th District action was postponed because of excessive rain on the field at Highland Park. PHOTO: Allen Ramsey, DWCPhoto.com. Highlands eighth-grader Taylar Lorenzen makes a play in a recent junior varsity game. 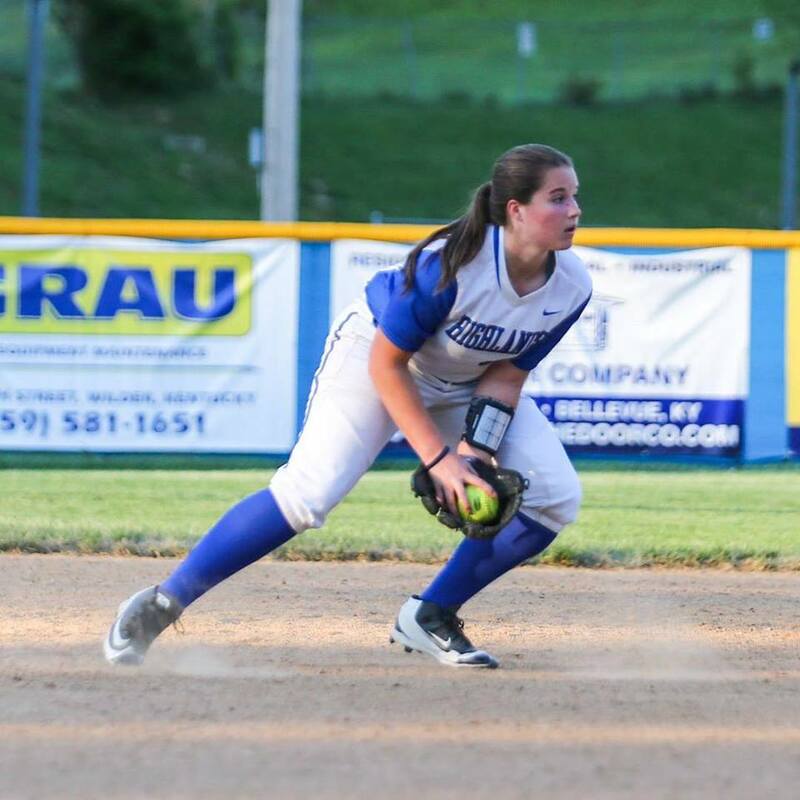 The Highlands Ladybirds (13-6 overall) handled the visiting Covington Holmes Lady Bulldogs, 15-0 in three innings in 9th Region softball action at Winkler Field. PHOTO: Allen Ramsey, DWCPhoto.com. Highlands freshman Morgan Coffey makes a catch in Monday's game against Newport Central Catholic. Highlands took control of the 36th District with a convincing 8-0 win. NEWPORT - The long-term goal may be Owensboro. 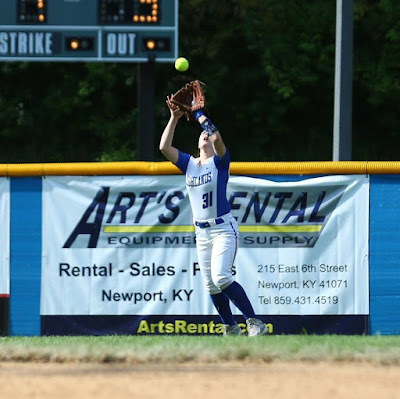 But to get back there, the Highlands Ladybirds softball team knows it needs to win its second-ever 9th Region crown after winning the first one two years ago. But for the regular season, the goal is to go undefeated in 36th District and region play. So far, it's gone well. 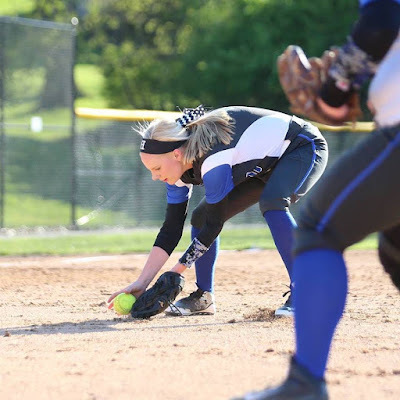 The Ladybirds (12-6 overall) remained undefeated in district and region play at 2-0 and 6-0 respectively with a convincing 8-0 win over the Newport Central Catholic Thoroughbreds at Veterans Park on Monday. NewCath beat Highlands at Winkler Field last year before the Ladybirds came back to beat NewCath in the district tournament championship. PHOTO: Allen Ramsey, DWCPhoto.com. 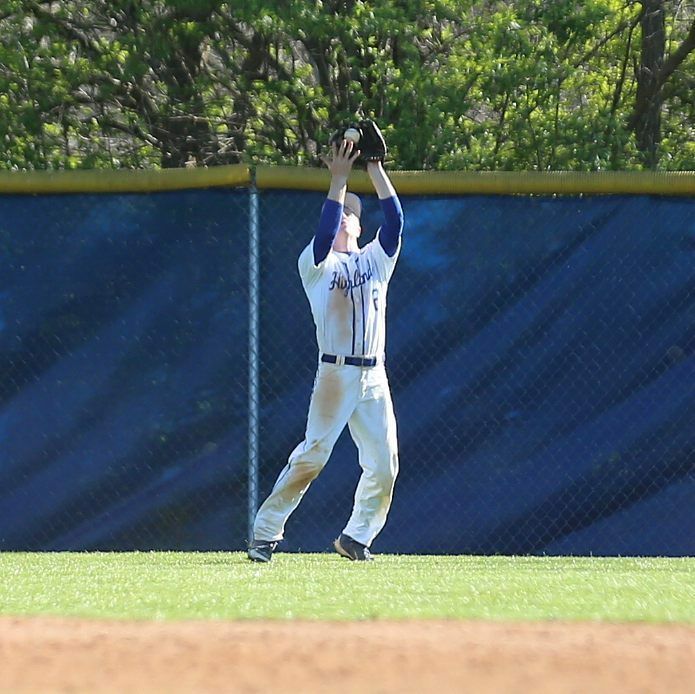 Highlands senior Austin Beal makes a catch in a recent game. 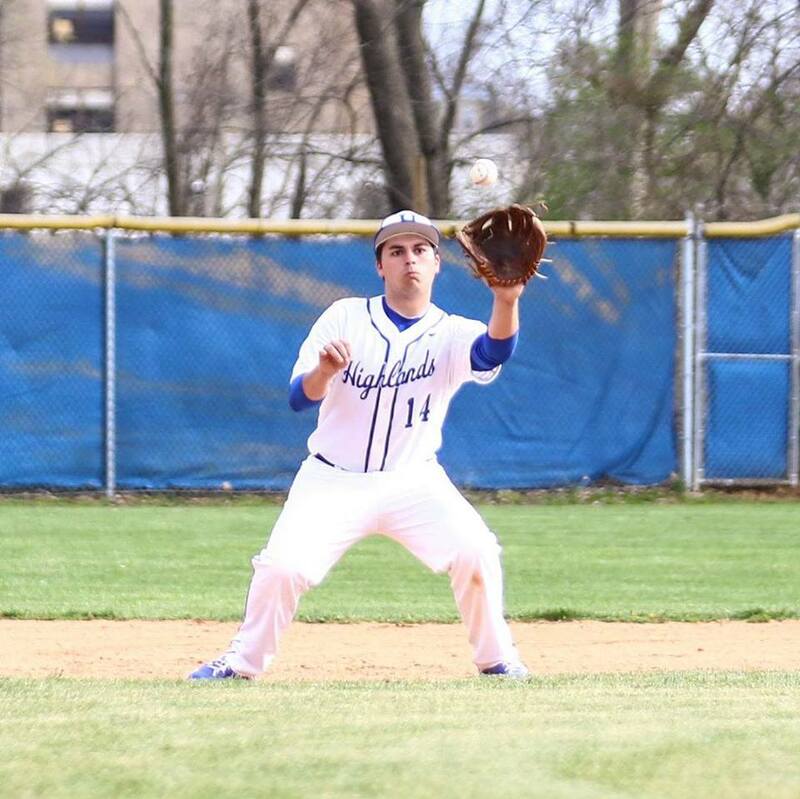 The Highlands Bluebirds baseball team (12-9 overall) split its games in the Reid Rizzo Classic on Saturday at Cincinnati LaSalle. Highlands opened the day with a 3-2 defeat against the Centerville (Ohio) Elks but rebounded to beat the Port Huron (Michigan) Big Red, 16-0 in five innings. 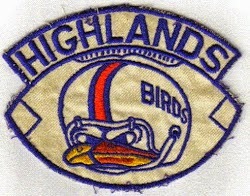 The Bluebirds moved to 1-5 against out-of-state competition. The five losses have come against Ohio teams including three against the tough Greater Catholic League South. 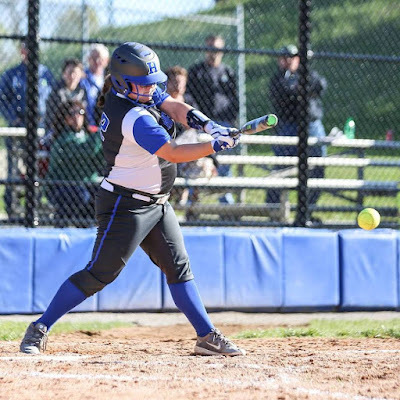 The Highlands softball (11-6) game slated for Friday at Ryle was cancelled as was the Saturday home game against Covington Holy Cross because of rain. There has been no word on any make-up dates. The Highlands Bluebirds baseball and softball teams recorded 9th Region run-rulings Wednesday. PHOTO: Allen Ramsey, DWCPhoto.com. Highlands senior shortstop Haley Coffey makes a play Tuesday at Cooper. Highlands won 11-0 in five innings. 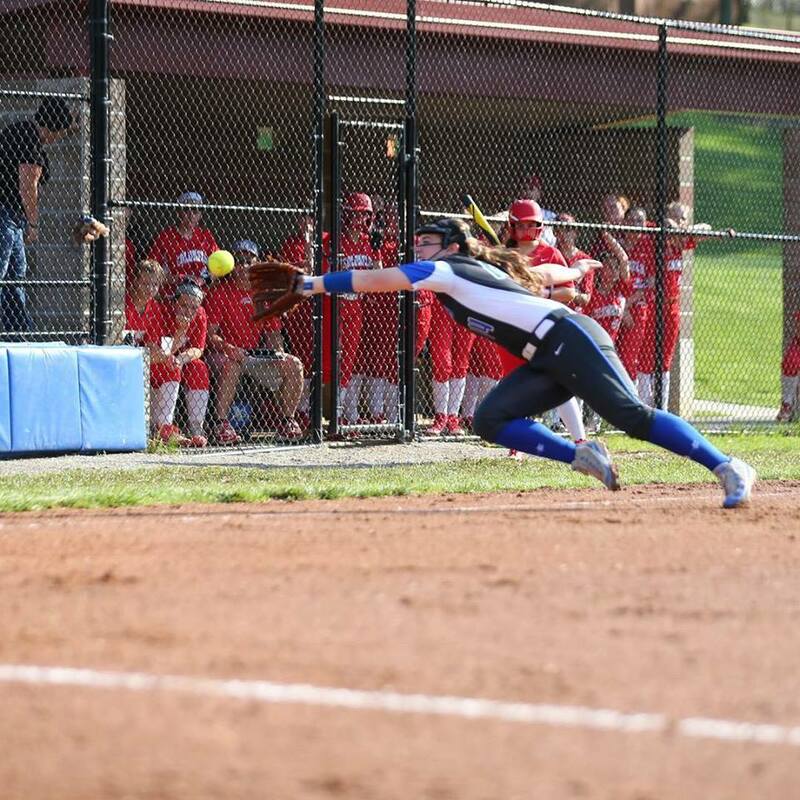 The Highlands Ladybirds softball team (10-6 overall) picked up another 9th Region run-ruling Tuesday with an 11-0 victory in five innings. PHOTO: Allen Ramsey, DWCPhoto.com. 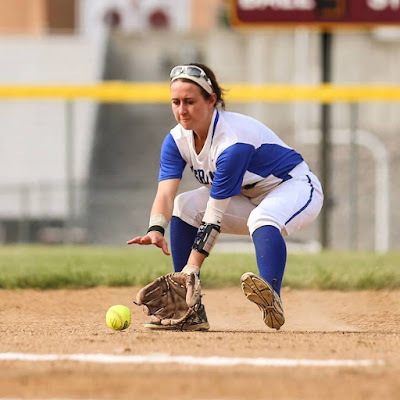 Highlands senior Bailey Spencer picks up a ground ball in a recent game. The Highlands Ladybirds dominated their district opener, 15-0 over the visiting Bellevue Lady Tigers in four innings. PHOTO: Allen Ramsey, DWCPhoto.com. Highlands senior pitcher Ricky Raisor (24) fires to the plate in a recent game. The Highlands Bluebirds baseball team (7-8 overall) lost its last two games of the Doc Morris Invitational at Dixie Heights. Highlands has lost five in a row. PHOTO: Allen Ramsey, DWCPhoto.com. Highlands junior Kyle Rust swings away in a recent game against Covington Catholic. 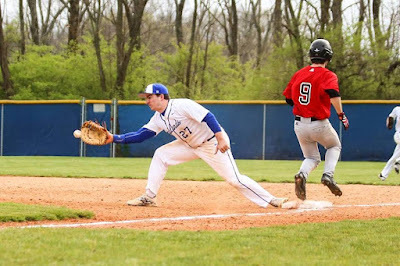 The Highlands Bluebirds baseball team (7-6 overall) fell in nine innings, 4-3 at the Dixie Heights Colonels on Thursday. PHOTO: Allen Ramsey, DWCPhoto.com. Highlands freshman Bryce Ziegler slams one over the fence in Wednesday's game against Covington Catholic. It marked his first home run of the season. 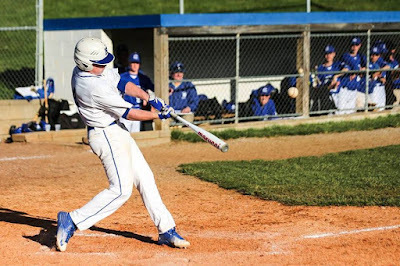 The Highlands Bluebirds baseball team (7-5 overall) jumped ahead with a run in the bottom of the first inning in 9th Region action at home Wednesday. PHOTO: Allen Ramsey, DWCPhoto.com. Highlands sophomore Maleah Abner brings in two runs with this hit in the sixth inning against Bishop Brossart on Tuesday. Highlands won 2-1. 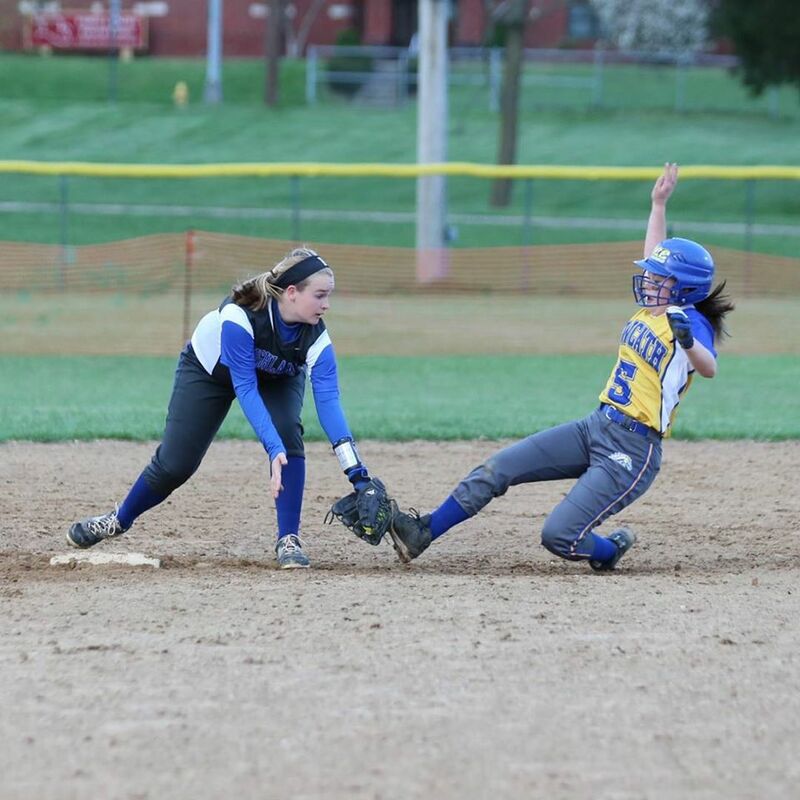 The Highlands Ladybirds softball team (8-6 overall) struggled against Bishop Brossart senior Kaitlyn Seiter. The Highlands Bluebirds baseball team (7-4 overall) dropped a 7-5 decision at Cincinnati St. Xavier on Sunday. The Bluebirds saw their six-game winning streak snapped as a result. 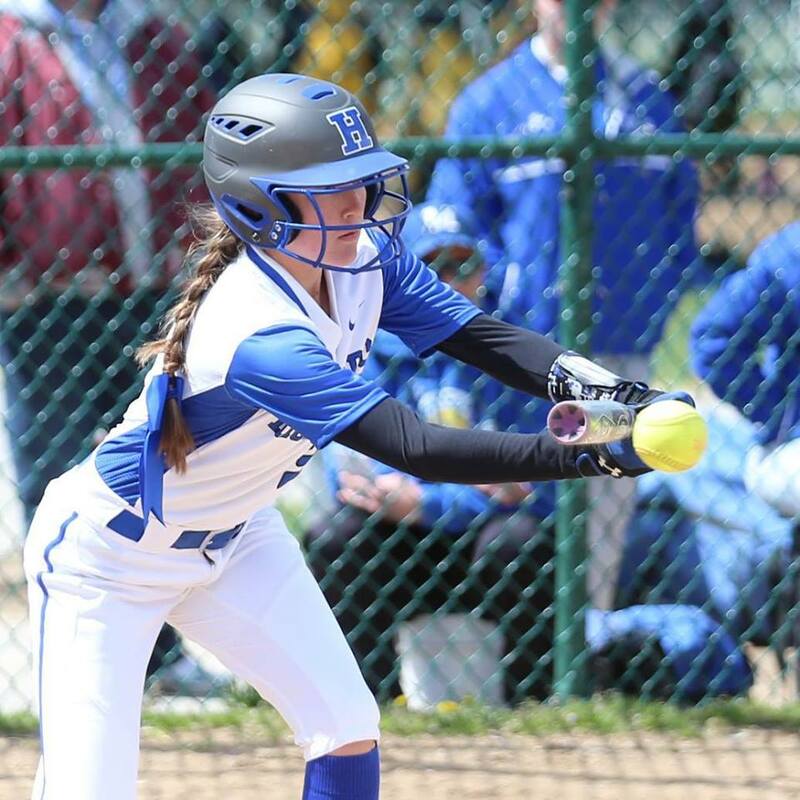 The Highlands Ladybirds softball team (7-6 overall) was scheduled to face Ohio schools Cincinnati Turpin and Springboro on Saturday. But cold weather forced the cancellation. 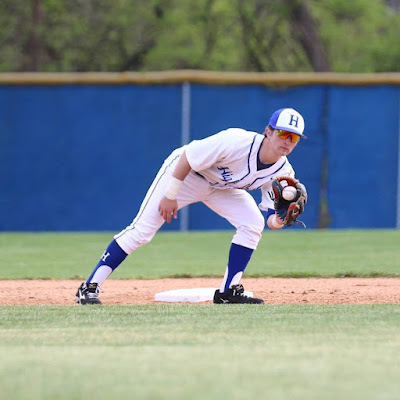 The Highlands Bluebirds baseball team (7-3 overall) was to travel to Cincinnati St. Xavier on Friday and face Cincinnati McNicholas on Saturday at Meinken Field in Covington as part of the Reds Futures Showcase. The Highlands Ladybirds softball team recorded a huge win Thursday on the road. PHOTO: Allen Ramsey, DWCPhoto.com. Highlands sophomore Drew Rom takes a cut in a recent game. The Bluebirds won all four games in Madisonville on their Spring Break trip. The Highlands Bluebirds baseball team completed its successful Spring Break trip to Madisonville with a sixth straight victory. PHOTO: Allen Ramsey, DWCPhoto.com. Highlands junior Kyle Rust makes a play in a recent game. Highlands won both games at Madisonville on Tuesday. 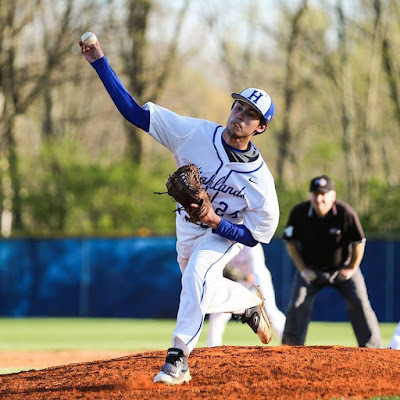 The Highlands Bluebirds baseball team moved to 6-3 on the season with two convincing wins over 2nd Region competition at Madisonville on Tuesday. PHOTO: Allen Ramsey, DWCPhoto.com. Highlands junior Ethan Doty nabs the ball in a recent game. The Highlands Bluebirds baseball team (4-3 overall) had to go to extra innings Monday. PHOTO: Highlands sophomore Brooke Dill puts down a bunt in Saturday's game in the Uncle Pete Noll Classic. Highlands finished third with two wins Saturday. The Highlands Ladybirds (6-5 overall) took third in the Uncle Pete Noll Classic at River City Park with two wins Saturday. PHOTO: Allen Ramsey, DWCPhoto.com. Highlands first baseman Mark Walkenhorst (27) reaches for the ball in a recent game against Covington Holy Cross. The Highlands Bluebirds baseball team (3-3 overall) is back at .500 on the season with a 6-1 non-region win over the Bishop Brossart Mustangs at Highland Park on Saturday. PHOTO: Allen Ramsey, DWCPhoto.com. Highlands second baseman Rachel Gabbard tags out Newport Central Catholic's Jaden Watts in Friday's game at River City Park. The Highlands Ladybirds softball team (4-5 overall) split its two games in the Uncle Pete Noll Classic at River City Park in Taylor Mill. The Highlands Bluebirds baseball team (2-3 overall) was scheduled to play Cincinnati Elder at Highland Park on Thursday. But excessive rains forced a postponement. The game was rescheduled for May 3.